Historically, artillery (from French artillerie) refers to any engine used for the discharge of large projectiles in war. The term also describes soldiers with the primary function of manning such weapons and is used organizationally for the arm of a nation's land forces that operates the weapons. This term includes coastal artillery, which has traditionally defended coastal areas against seaborne attack and controlled the passage of ships. With the advent of powered flight at the start of the twentieth century, artillery has included ground-based anti-aircraft batteries. Naval piece of artillery, early nineteenth century. French naval piece of the late nineteenth century. The word as used in the current context originated in the Middle Ages. It comes from the Old French atellier meaning "to arrange," and attillement meaning "equipment." From the thirteenth century an artillier referred to a builder of any war equipment, and for the next 250 years the sense of the word "artillery" covered all forms of military weapons. Hence the naming of the Honourable Artillery Company an essentially Infantry unit until the nineteenth century. Older engines like the catapult, onager, trebuchet, and ballista are artillery (see siege engines for more information on pre-gunpowder devices), but the first documented record of artillery with gunpowder propellant used on the battlefield is on January 28, 1132, when General Han Shizhong of the Song Dynasty used escalade and Huochong to capture a city in Fujian. These small, crude weapons diffused into the Middle East (the madfaa) and reached Europe in the thirteenth century, in a very limited manner. These small smoothbore tubes were initially cast in iron or bronze around a core, the first with the bore drilled was recorded in operation near Seville in 1247. They fired lead, iron, or stone balls, sometimes large arrows and on occasions simply handfuls of whatever scrap came to hand. During the Hundred Years' War these weapons became more common, initially as the bombard and later the cannon. Cannon were always muzzle-loaders, there were many early attempts at breech-loading designs but weakness in engineering rendered them even more dangerous to use than muzzle-loaders. Bombards were larger than previous weapons, massive smoothbore weapons distinguished by their lack of a field carriage, immobility once emplaced, highly individual design, and noted unreliability. Their size precluded the barrels being cast and they were constructed out of metal staves or rods bound together with hoops like a barrel. Bombards were of value mainly in sieges, a famous Turkish example used at the siege of Constantinople in 1453 massed 19 tons, took 200 men and sixty oxen to emplace and could fire seven times a day. The use of the word "cannon" marks the introduction in the fifteenth century of a dedicated field carriage with axle, trail and animal-drawn limber - this produced mobile field pieces that could move and support an army in action, rather than being found only in siege and static defenses. The reduction in the size of the barrel was due to improvements in both iron technology and gunpowder manufacture. The first mobile weapon is usually credited to Jan Žižka, who deployed his oxen-hauled cannon during the Hussite Wars of Bohemia (1418-1424). However cannon were still large and cumbersome, with the rise of musketry in the sixteenth century cannon were largely displaced from the battlefield—the cannon were too slow and cumbersome to be used and too easily lost to a rapid enemy advance. The combining of shot and powder into a single unit, a cartridge, occurred in the 1620s with a simple fabric bag, and was quickly adopted by all nations. It speeded loading and made it safer, but unexpelled bag fragments were an additional fouling in the gun barrel and a new tool—a worm—was introduced to remove them. Gustavus Adolphus is identified as the general who reintroduced cannon to the battlefield—pushing the development of much lighter and smaller weapons and deploying them in far greater numbers than previously. But the outcome of battles was still determined by the clash of infantry. Shells, explosive-filled fused projectiles, were also developed in the seventeenth century. The development of specialized pieces—shipboard artillery, howitzers and mortars—was also begun in this period. More esoteric designs, like the multi-barrel ribauldequin, were also built. The seventeenth-century book by Polish-Lithuanian Commonwealth inventor Kazimierz Siemienowicz "Artis Magnae Artilleriae pars prima" ("Great Art of Artillery, the First Part," also known as "The Complete Art of Artillery") was one of the most important contemporary publications on the subject of artillery. For over two centuries, this work was used in Europe as a basic artillery manual. Cannon continued to become smaller and lighter—Frederick II of Prussia deployed the first genuine light artillery during the Seven Years War—but until the mid-nineteenth century improvements in metallurgy, chemistry, manufacturing and other sciences did not alter the basic design and operation of a cannon. Rifling had been tried on small arms in the fifteenth century. The machinery to accurately rifle a cannon barrel did not arrive until the nineteenth. Cavelli, Wahrendorff, and Whitworth all independently produced rifled cannon in the 1840s, but these guns did not see widespread use until the latter stages of the American Civil War—when designs such as the various calibre Rodman guns came to prominence. Artillery continued to gain prominence in the eighteenth century, when Jean-Baptiste de Gribeauval, a French artillery engineer introduced the standardization of cannon design. 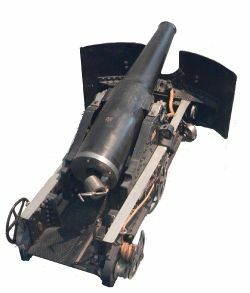 He developed a 6-inch field howitzer whose gun barrel, carriage assembly and ammunition specifications were made uniform for all French cannons. The standardized interchangeable parts of these cannons down to the nuts, bolts and screws made their mass production and repair much easier. Another major change at this time was the development of a flintlock firing mechanism for the cannons. 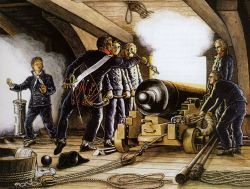 The old method of firing the cannon involved the use of a linstock or match to light a small quantity of powder charge in a touchhole drilled into the breech. This technique was quite faulty because the ignited powder could easily be extinguished by rain and an excess amount of charge could cause the guns to burst. The flintlock mechanism on the other hand only needs to be cocked and when its trigger is pulled the flint of the hammer strikes the frizzen throwing sparks into the pan and detonating the charge at the breech. The trigger can be tied to a lanyard and fired from a safe distance. These changes laid down in 1789 would prove decisive for Napoleon's conquests. From the 1860s artillery was forced into a series of rapid technological and operational changes, accelerating through the 1870s and thereafter. the first effective breech-loaders (allowing a gun crew to operate while always behind protective barriers) was developed in the 1880s, with the first cannon to contain all "modern" features is generally considered to be the French 75 of 1897—cased ammunition, entirely effective breech-loading, modern sights, self-contained firing mechanism, and especially its hydro-pneumatic recoil dampening. In the nineteenth century artillery finally made the decisive split between smaller, lighter, and more mobile pieces that stayed with the troops, and much larger weapons deployed to use indirect fire. The second option, using indirect fire, drove the development of the technologies and doctrines that have produced current artillery weapons. Modern artillery is most obviously distinguished by its large caliber, firing an explosive shell or rocket, and being of such a size and weight as to require a specialized carriage for firing and transport. However, its most important characteristic is the use of indirect fire, whereby the firing equipment is aimed without seeing the target through its sights. Indirect fire emerged at the beginning of the twentieth century and was greatly enhanced by the development of predicted fire methods in World War I. Indirect fire uses firing data set on the sights, predicted fire methods ensure that this data is accurate and corrects for variations from the standard conditions for muzzle velocity, temperature, wind and air density. Weapons covered by the term "modern artillery" include "cannon" artillery such as the howitzer, mortar, and field gun and rocket artillery. Certain smaller-caliber mortars are more properly designated small arms rather than artillery, albeit indirect-fire small arms. The term "artillery" has traditionally not been used for projectiles with internal guidance systems, even though some artillery units employ surface-to-surface missiles. Advances in terminal guidance systems for small munitions has allowed large-caliber projectiles to be developed, blurring this distinction. Cyclone of the 320th French Artillery, in Hogstade, Belgium, 5 September 1917. Because field artillery mostly uses indirect fire, the guns have to be part of a system that enables them to attack targets invisible to them in accordance with the combined arms plan. Logistic services—to provide combat supplies, particularly ammunition, and equipment support. Organizationally and spatially these functions can be arranged in many ways. Since the creation of modern indirect fire different armies have done it differently at different times and in different places. Technology is often a factor but so are military-social issues, the relationships between artillery and other arms, and the criteria by which military capability, efficiency and effectiveness are judged. Cost is also an issue because artillery is expensive due to the large quantities of ammunition that it uses and its level of manpower. Communications underpin the artillery system, they have to be reliable and in real-time to link the various elements. During the twentieth century, communications used flags, Morse code by radio, line and lights, voice and teletype (teleprinter) by line. Radio has included HF, VHF, satellite and radio relay as well as modern tactical trunk systems. In Western armies, at least, radio communications are now usually encrypted. The emergence of mobile and man-portable radios after World War I had a major impact on artillery because it enable fast and mobile operations with observers accompanying the infantry or armored troops. In World War II, some armies fitted their self-propelled guns with radios. However, sometimes in the first half of the twentieth century, hardcopy artillery fire plans and map traces were distributed. Data communications can be especially important for artillery because by using structured messages and defined data types fire control messages can be automatically routed and processed by computers. For example a target acquisition element can send a message with target details which is automatically routed through the tactical and technical fire control elements to deliver firing data to the gun's laying system and the gun automatically laid. As tactical data networks become pervasive they will provide any connected soldier with a means for reporting target information and requesting artillery fire. Command is the authority to allocate resources, typically by assigning artillery formations or units. Terminology and its implications vary widely. However, very broadly, artillery units are assigned in direct support or in general support. Typically, the former mostly provide close support to maneuver units while the latter may provide close support and or depth fire, notably counter-battery. Generally, "direct support" also means that the artillery unit provides artillery observation and liaison teams to the supported units. Sometimes direct support units are placed under command of the regiment/brigade they support. General support units may be grouped into artillery formations, for example, brigades even divisions, or multi-battalion regiments, and usually under command of division, corps or higher HQs. General support units tend to be moved to where they are most required at any particular time. Artillery command may impose priorities and constraints to support their combined arms commander's plans. Target acquisition can take many forms, it is usually observation in real time but may be the product of analysis. Artillery observation teams are the most common means of target acquisition. However, air observers have been use since the beginning of indirect fire and were quickly joined by air photography. Target acquisition may also be by anyone that can get the information into the artillery system. Targets may be visible to forward troops or in depth and invisible to them. Observation equipment can vary widely in its complexity. Unmanned air vehicles are the latest form of air observation, having been first introduced in the early 1960s. The equipment available to observation teams has progressed from just prismatic compass, hand-held or tripod mounted binoculars and sometimes optical range-finders. Special equipment for locating hostile artillery: Flash spotting and notably sound ranging appeared in World War I the latter has been undergone increasing refinement as technology has improved. These were joined by radar in World War II. In the mid-1970s several armies started equipping their artillery observation teams with laser range-finders, ground surveillance radars and night vision devices, these were soon followed by inertial orienting and navigating devices to improve the accuracy of target locations. The Global Positioning System (GPS) provided a smaller and cheaper means of quick and accurate fixation for target acquisition devices. Specialized units with ground surveillance radars, unattended ground sensors or observation patrols operating in depth have also been used. Targets in depth may also be 'acquired' by intelligence processes using various sources and agencies such as HUMINT, SIGINT, ELINT, and IMINT. Laser guided shells require laser target designators, usually with observation teams on the ground but UAV installations are possible. Specialised artillery observation vehicles appeared in World War 2 and have greatly increased in sophistication since that time. Control, sometimes called tactical fire control, is primarily concerned with "targeting" and the allotment of fire units to targets. This is vital when a target is within range of many fire units and the number of fire units needed depends on the nature of the target, and the circumstances and purpose of its engagement. Targeting is concerned with selecting the right weapons in the right quantities to achieve the required effects on the target. Allotment attempts to address the artillery dilemma—important targets are rarely urgent and urgent targets are rarely important. Of course importance is a matter of perspective; what is important to a divisional commander is rarely the same as what is important to an infantry platoon commander. Broadly, there are two situations: Fire against opportunity targets and targets whose engagement is planned as part of a particular operation. In the latter situation command assigns fire units to the operation and an overall artillery fire planner makes a plan, possibly delegating resources for some parts of it to other planners. Fire plans may also involve use of non-artillery assets such as mortars and aircraft. Control of fire against opportunity targets is an important differentiator between different types of artillery system. In some armies only designated artillery HQs have the tactical fire control authority to order fire units to engage a target, all "calls for fire" being requests to these HQs. This authority may also extend to deciding the type and quantity of ammunition to be used. In other armies an "authorized observer" (for example, artillery observation team or other target acquisition element) can order fire units to engage. In the latter case a battery observation team can order fire to their own battery and may be authorized to order fire to their own battalion and sometimes to many battalions. For example a divisional artillery commander may authorize selected observers to order fire to the entire divisional artillery. When observers or cells are not authorized they can still request fire. Armies that apply forward tactical control generally put the majority of the more senior officers of artillery units forward in command observation posts or with the supported arm. Those that do not use this approach tend to put these officers close to the guns. In either case, the observation element usually controls fire in detail against the target, such as adjusting it onto the target, moving it and coordinating it with the supported arm as necessary to achieve the required effects. Firing data has to be calculated and is the key to indirect fire, the arrangements for this have varied widely. In the end firing data has two components: Quadrant elevation and azimuth, to these may be added the size of propelling charge and the fuze setting. The process to produce firing data this is sometimes called technical fire control. Until computers some armies set the range on the gun's sights, which mechanically corrected it for the gun's muzzle velocity. For the first few decades of indirect fire the firing data were often calculated by the observer who then adjusted the fall of shot onto the target. However, the need to engage targets at night, in depth or hit the target with the first rounds quickly led to predicted fire being developed in World War I. Predicted fire existed along side the older method. After World War II predicted methods were invariably applied but the fall of shot usually needed adjustment because of inaccuracy in locating the target, the proximity of friendly troops or the need to engage a moving target. Target location errors were significantly reduced once laser rangefinders, orientation and navigation devices were issued to observation parties. In predicted fire the basic geospatial data of range, angle of sight and azimuth between a fire unit and its target was produced and corrected for variations from the "standard conditions." These variations included barrel wear, propellant temperature, different projectiles weights that all affected the muzzle velocity, and air temperature, density, wind speed & direction and rotation of the earth that affect the shell in flight. The net effect of variations can also be determined by shooting at an accurately known point, a process called "registration." All these calculations to produce a quadrant elevation (or range) and azimuth were done manually by highly trained soldiers using instruments, tabulated data, data of the moment and approximations until battlefield computers started appearing in the 1960s and ‘70s. While some early calculators copied the manual method (typically substituting polynomials for tabulated data), computers use a different approach. They simulate a shell's trajectory by "flying" it in short steps and applying data about the conditions affecting the trajectory at each step. This simulation is repeated until it produces a quadrant elevation and azimuth that lands the shell within the required "closing" distance of the target co-ordinates. NATO has a standard ballistic model for computer calculations and has expanded the scope of this into the NATO Armaments Ballistic Kernal (NABK). Technical fire control has been performed in various places, but mostly in firing batteries. However, in the 1930s the French moved it to battalion level and combined it with some tactical fire control, this was copied by the U.S. Nevertheless most armies seemed to have retained it within firing batteries and some duplicated the technical fire control teams in a battery to give operational resilience and tactical flexibility. Computers reduced the number of men needed and enabled decentralization of technical fire control to autonomous sub-battery fire units such as platoons, troops or sections, although some armies had sometimes done this with their manual methods. Computation on the gun or launcher, integrated with their laying system, is also possible. MLRS led the way in this. A fire unit is the smallest artillery or mortar element, consisting of one or more weapon systems, capable of being employed to execute a fire assigned by a tactical fire controller. Generally it is a battery, but sub-divided batteries are quite common, and in some armies very common. On occasions a battery of 6 guns has been 6 fire units. Fire units may or may not occupy separate positions. Geographically dispersed fire units may or may not have an integral capability for technical fire control. Survey—accurate fixation and orientation of the guns, historically this involved specialists within field artillery units and specialist units. In some armies mapping and amp supply has also been an artillery responsibility. Survey is also essential for some target acquisition devices. Traditional survey methods of measurement and calculation have been replaced by inertial orientation and navigators and GPS. Meteorological data—historically these were usually divisional level specialist teams but advances in technology mean they are now increasingly part of artillery units. Calibration—periodically establishing the "normal" muzzle velocity of each gun as it wears. Originally this involved special facilities and army level teams. Measurement using Doppler radar, introduced in the 1950s, started to simplify arrangements. Some armies now have a muzzle velocity measuring radar permanently fitted to every gun. Logistic services, supply of artillery ammunition has always been a major component of military logistics. Up until World War I some armies made artillery responsible for all forward ammunition supply because the load of small arms ammunition was trivial compared to artillery. Different armies use different approaches to ammunition supply, which can vary with the nature of operations. Differences include where the logistic service transfers artillery ammunition to artillery, the amount of ammunition carried in units and extent to which stocks are held at unit or battery level. A key difference is whether supply is "push" or "pull." In the former the "pipeline" keeps pushing ammunition into formations or units at a defined rate. In the latter units fire as tactically necessary and replenish to maintain or reach their authorized holding (which can vary), so the logistic system has to be able to cope with surge and slack. Artillery has always been equipment intensive and for centuries artillery provided its own artificers to maintain and repair their equipment. Most armies now place these services in specialist branches with specialist repair elements in batteries and units. Artillery types can be categorized in several ways, for example by type or size of weapon or ordnance, by role or by organizational arrangements. Horse artillery, first formed as regular units in late eighteenth century, with the role of supporting cavalry, they were distinguished by the entire crew being mounted. Field artillery, the main artillery arm of the field army, using either guns, howitzers or mortars. In World War II, this branch again started using rockets and later surface-to-surface missiles. Fortress, foot or garrison artillery, manned a nation's fixed defenses using guns, howitzers or mortars, either on land or coastal frontiers. Some had deployable elements to provide heavy artillery to the field army. In some nations coast defense artillery was a naval responsibility. Naval artillery, some nations carried pack artillery on some warships, these were used and manhandled by naval (or marine) landing parties. Anti-tank artillery, also under various organizational arrangements but typically either field artillery or a specialist branch and additional elements integral to infantry, and so on, units. However, in most armies field and anti-aircraft artillery also had at least a secondary anti-tank role. After World War II, anti-tank in Western armies became mostly the responsibility of infantry and armoured branches and ceased to be an artillery matter, with some exceptions. Anti-aircraft artillery, under various organizational arrangements including being part of artillery, a separate corps, even a separate service or being split between army for the field and air force for home defense. In some cases infantry and the new armoured corps also operated their own integral light anti-aircraft artillery. Home defense anti-aircraft artillery often used fixed as well as mobile mountings. Some anti-aircraft guns could also be used as field or anti-tank artillery, providing they had suitable sights. However, the general switch by artillery to indirect fire before and during World War I led to a reaction in some armies. The result was accompanying or infantry guns. These were usually small, short range guns, that could be easily man-handled and used mostly for direct fire but some could use indirect fire. Some were operated by the artillery branch but under command of the supported unit. In World War II, they were joined by self-propelled assault guns, although other armies adopted infantry or close support tanks in armored branch units for the same purpose, subsequently tanks generally took on the accompanying role. The three main types of artillery "gun" are guns, howitzers and mortars. During the twentieth century, guns and howitzers have steadily merged in artillery use, making a distinction between the terms somewhat meaningless. By the end of the twentieth century, true guns with calibers larger than about 60 mm had become very rare in artillery use, the main users being tanks, ships, and a few residual anti-aircraft and coastal guns. The traditional definitions differentiated between guns and howitzers in terms of maximum elevation (well less than 45º as opposed to close to or greater than 45º), number of charges (one or more than one charge), and having higher or lower muzzle velocity, sometimes indicated by barrel length. These three criteria give eight possible combinations, of which guns and howitzers are but two. However, modern "howitzers" have higher velocities and longer barrels than the equivalent "guns" of the first half of the twentieth century. True guns are characterized by long range, having a maximum elevation significantly less than 45º, a high muzzle velocity and hence a relatively long barrel, and a single charge. The latter often led to fixed ammunition where the projectile is locked to the cartridge case. There is no generally accepted minimum muzzle velocity or barrel length associated with a gun. A British 60-pounder (5 inch) gun at full recoil, in action during the Battle of Gallipoli, 1915. Howitzers can fire at maximum elevations at least close to 45º, and up to about 70º is normal for modern ones. They also have a choice of charges, meaning that the same elevation angle of fire will achieve a different range depending on the charge used. They have lower muzzle velocities and shorter barrels than equivalent guns. All this means they can deliver fire with a steep angle of descent. Because of their multi-charge capability, their ammunition is mostly separate loading (the projectile and propellant are loaded separately). That leaves six combinations of the three criteria, some of which have been termed gun-howitzers. A term first used in the 1930s when howitzers with a relatively high maximum muzzle velocities were introduced, it never became widely accepted, most armies electing to widen the definition of "gun" or "howitzer." By the 1960s, most equipments had maximum elevations up to about 70º, were multi-charge, had quite high maximum muzzle velocities and relatively long barrels. Mortars are simple, the modern mortar originated in World War 1 and there were several patterns. After that war, most mortars settled on the Stokes pattern, characterised by a short barrel, smooth bore, low muzzle velocity, generally firing at an elevation angle greater that 45º, and a very simple and light mounting using a "baseplate" on the ground. The projectile with its integral propelling charge was dropped down the barrel from the muzzle to hit a fixed firing pin. Since that time, a few mortars have become rifled and adopted breech loading. There are other recognized typifying characteristics for artillery. First the type of obturation used to seal the chamber and prevent gases escaping through the breech. This may use a metal cartridge case that also holds the propelling charge, a configuration called "QF" or "quickfiring" by some nations. The alternative does not use a metal cartridge case, the propellant being merely bagged or in combustible cases with the breech itself providing all the sealing. This is called "BL" or "breech loading" by some nations. A second characteristic is the form of propulsion. Basically modern equipment can either be towed or self-propelled (SP). A towed gun fires from the ground and any inherent protection is limited to a gun shield. Towing by horse teams lasted throughout World War II in some armies, but others were fully mechanised with wheeled or tracked gun towing vehicles by the outbreak of that war. The size of a towing vehicle depends on the weight of the equipment and the amount of ammunition it has to carry. A variation of towed is portee where the vehicle carries the gun which is dismounted for firing. Mortars are often carried this way. A mortar is sometimes carried in an armored vehicle and can either fire from it or be dismounted to fire from the ground. Since the early 1960s it has been possible to carry lighter towed guns and most mortars by helicopter. Even before that, they were parachuted or landed by glider from the time of the first airborne trials in the USSR in the 1930s. In an SP equipment, the gun is an integral part of the vehicle that carries it. SPs first appeared during World War I, but did not really develop until World War II. They are mostly tracked vehicles, but wheeled SPs started to appear in the 1970s. Some SPs have no armor and carry little or no ammunition. Armored SPs usually carry a useful ammunition load. Early armored SPs were mostly a "casemate" configuration, in essence an open top armored box offering only limited traverse. However, most modern armored SPs have a full enclosed armored turret, usually giving full traverse for the gun. Many SPs cannot fire without deploying stabilizers or spades, sometimes hydraulic. A few SPs are designed so that the recoil forces of the gun are transferred directly onto the ground through a baseplate. A few towed guns have been given limited self-propulsion by means of an auxiliary engine. Two other forms of tactical propulsion were used in the first half of the twentieth century: Railways or transporting the equipment by road, as two or three separate loads, with disassembly and re-assembly at the beginning and end of the journey. 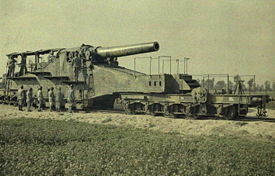 Railway artillery took two forms, railway mountings for heavy and super-heavy guns and howitzers and armored trains as "fighting vehicles" armed with light artillery in a direct fire role. Disassembled transport was also used with heavy and super heavy weapons and lasted into the 1950s. A third form of artillery typing is to classify it as "light," "medium," "heavy," and various other terms. It appears to have been introduced in World War I, which spawned a very wide array of artillery in all sorts of sizes so a simple categorical system was needed. Some armies defined these categories by bands of calibres. Different bands were used for different types of weapons—field guns, mortars, anti-aircraft guns, and coast guns. Fuzes activate a projectile's terminal effects. Broadly there are two main types: Impact (including graze and delay) and airburst. The latter uses either a timer or a proximity sensor. When used with HE shells, airburst fuzes usually have a combined airburst and impact function. However, until the introduction of electronic proximity point detonating fuzes, the airburst function was mostly used with cargo munitions—for example shrapnel, illuminating, smoke and improved conventional munitions. Airburst HE is more lethal than groundburst against many targets. The larger calibers of anti-aircraft artillery are almost always used airburst. Most artillery fuzes are nose fuzes. However, base fuzes have been used with armour piercing shells and for squash head (HESH or HEP) anti-tank shells. At least one nuclear shell and its non-nuclear spotting version also used a multi-deck mechanical time fuze fitted into its base. Early airburst fuzes used igniferous timers which lasted into the second half of the twentieth century. Mechanical time fuzes appeared in the early part of that century. These required a means of powering them. The Thiel mechanism used a spring and escapement (i.e. "clockwork"), Junghans used centrifugal force and gears, and Dixi used centrifugal force and balls. By the 1990s, electronic time fuzes had been introduced. Proximity fuzes have been of two types: Photo-electric or radar. The former was not very successful and seems only to have been used with British anti-aircraft artillery "unrotated projectiles" (in other words, rockets) in World War II. The first radar proximity fuzes (called VT for variable time as an obfuscating security measure) were also used for anti-aircraft purposes in World War II. Their ground use was delayed for fear of the enemy recovering blinds (artillery rounds which failed to detonate) and copying the fuze. The first radar proximity fuzes were designed to detonate at a specified height above the ground, about 30 feet. These air-bursts are much more lethal against personnel than ground bursts because they deliver a greater proportion of useful fragments and deliver them into terrain where a prone soldier would be protected from ground bursts. However, proximity fuzes can suffer premature detonation because of the moisture in heavy rain clouds. This led to "controlled variable time" (CVT) after World War II. These fuzes have a mechanical timer that switched on the radar about 5 seconds before expected impact. Modern multi-role fuzes usually have selectable height of burst option from "daisy-cutters" upwards, although these settings can also be used to deal with extremes of soil reflectivity (basically the amount of water). The proximity fuze emerged on the battlefields of Europe in late December 1944. They have become known as the U.S. Artillery's "Christmas present," and were much appreciated when they arrived during the Battle of the Bulge. Proximity fuzes were extremely effective against German personnel in the open, and hence were very helpful in breaking up the German attacks. Electronic proximity fuzes were a big improvement over the mechanical (non-proximity) fuzes which they replaced, as time fuzes required an accurate estimate of the round's time of flight to the target and especially of the altitude of the target area. If the target's altitude was incorrectly estimated, the rounds would either strike the ground or burst too high. Delay fuzes are used to allow the round to penetrate into the earth before exploding. This is very effective for attacking earthen bunkers. Similarly, hardened delay fuzes are used against concrete bunkers. Graze fuzes were activated by shell retardation, for example passing through light cover that was insufficiently solid to activate an impact fuze. During World War II, another method of HE airburst was used. Ricochet fire using delay or graze fuzed shells fired with a flat angle of descent. The projectile is the ordnance (in U.S. terminology—this term has a very different meaning for artillery in other parts of the English speaking world) or "bullet" fired downrange. This may or may not be an explosive device. Traditionally, projectiles have been classified as "shot" or "shell," the former being solid and the latter having some form of "payload." Shells can also be divided into three configurations: Bursting, base ejection or nose ejection. The latter is sometimes called the shrapnel configuration. The most modern is base ejection, which was introduced in World War I. Both base and nose ejection are almost always used with airburst fuzes. Bursting shells use various types of fuze depending on the nature of the payload and the tactical need at the time. Bursting—high-explosive, white phosphorus ("Willie Pete" or "Wilson Picket"), colored marker, chemical, nuclear devices; high explosive anti-tank (HEAT) and canister may be considered special types of bursting shell. Base Ejection—dual purpose improved conventional munitions (DPICM)-bomblet, scatterable mines, illuminating, colored flare, smoke, incendiary, propaganda, "window" (foil to jam radars) and modern exotics such as electronic payloads and sensor-fuzed munitions. Nose Ejection—shrapnel, flechette, star, incendiary. Smoothbore—mostly used by mortars and more recently by tanks. Some projectiles, such as high explosive anti-tank (HEAT), are less effective if they are spinning. Fin-stabilized—Use fins at the rear of the projectile in the airflow to maintain correct orientation. Mortars, rockets, and kinetic energy penetrators like APFSDS are the main users of stabilization by fin. Inverted tube—Some weapons have been built with the tube built into the projectile and fitted onto a rod fitted to the carriage. These are commonly known as spigot rounds, they were usually used for mortars but have been little used since World War I. All forms of artillery require a propellant to propel the projectile at the target. Propellant is a low explosive, this means it explodes instead of detonating, which is what a high explosive does. However, this exploding is often called burning in the context of propellant. The shell is moved to a high velocity in a very short time by the very rapid generation of gas from the exploding propellant under pressure. This pressure is achieved because the gas is generated in a container, either the chamber of a gun barrel or the combustion chamber of a rocket motor. Until the late nineteenth century, gunpowder was used as propellant. In 1846, guncotton was discovered, nitro-glycerine was discovered at much the same time. Both exploded too fast to be a propellant, but led to the development of various low explosive compounds including nitro-cellulose in the 1880s. These were often called "smokeless powder" at the time. "Ballistite" was one and "Cordite" another. The latter was a compound of guncotton and nitro-glycerine. Other names for similar compounds were used by various nations. Many other formulations were developed in the following decades, generally trying to find the optimum balance in the characteristics of a good artillery propellant, notably energy and temperature. Too much of the latter means barrels wear too fast. Broadly, gun propellants into two classes: Single-base propellant using nitro-cellulose and double-base using nitro-cellulose and nitro-glycerine. Around the time of World War I, salts started being added to propellants to reduce the muzzle flash. Between the world wars double-base propellants were modified with a substantial proportion of nitro-guanidine (picrite), this reduced muzzle-flash and temperature. Tube fired—utilize the pressure of exploding propellant inside a barrel to force a projectile out of the mouth of the barrel. This is the pattern adopted from the earliest guns to the present time. Recoilless—A tube fired weapon with a breech designed to perforate a bursting disk at firing, and permit a mass of burnt propellant gases with momentum equal to the projectile to exit from the rear of the barrel, to prevent recoil from affecting the weapon. Recoilless guns were invented in the 1930s in the USSR. Rocket propelled—Tube or rail launched—A reaction propulsion system mounted to the projectile provides continuous thrust for an initial period of the flight. Rocket assisted projectiles (RAP) enhance and sustain the projectile's velocity by providing additional 'push' from a small rocket motor that is part of the projectile's base. Base bleed uses a small pyrotechnic charge at the base of the projectile to introduce sufficient combustion products into the low-pressure region behind the base of the projectile responsible for a large proportion of the drag. Ramjet assisted, similar to rocket assisted but using a ramjet instead of a rocket motor. Propelling charges for tube artillery can be provided in one of two ways: either as cartridge bags or in metal cartridge cases. Each requires a totally different type of breech to the other. A metal case holds an integral primer to initiate the propellant and provides the gas seal to prevent the gases leaking out of the breech, this is called obturation. With bagged charges the breech itself provides obturation and holds the primer. In either case the primer is usually percussion but electrical is also used and laser ignition is emerging. Modern 155 mm guns have a primer magazine fitted to their breech. True guns basically have only a single size of charge for a type of projectile. However, a characteristic of howitzers is use of multiple charge increments (bags of propellant, either tied together or in a metal cartridge case), with the appropriate number of bags being used for the required range. These increment bags usually differ in size and sometimes contain different propellant types. In the 1990s modular propellant started to appear for 155 mm artillery. These are ‘bagged’ charges using a combustible container and comprise a base charge with identical increments. Battleship Ammunition: 16" artillery shells aboard one of America's Iowa-class battleships. Service: Ammunition used in live fire training or for wartime use in a combat zone. Practice: Ammunition with a low, or no explosive charge for use under training conditions. Dummy:Ammunition with no explosive charges for display or training use. Blank Ammunition with a low explosive and no projectile used for training or ceremonial use. 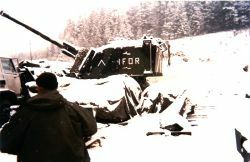 An AuF1 of the French artillery detachment of the IFOR near Sarajevo in 1996. Artillery is used in a variety of roles depending on its type and caliber. The general role of artillery is to provide fire support—"the application of fire, coordinated with the manoeuvre of forces to destroy, neutralize or suppress the enemy." This NATO definition, of course, makes artillery a supporting arm, although not all NATO armies agree with this logic. The italicized terms are NATO's. Unlike rockets, guns (or howitzers as some armies still call them) and mortars are suitable for delivering close supporting fire. However, they are all suitable for providing deep supporting fire although the limited range of many mortars tends to exclude them from the role. Their control arrangements and limited range also mean that mortars are most suited to direct supporting fire. Guns are used either for this or general supporting fire while rockets are mostly used for the latter. However, lighter rockets may be used for direct fire support. These rules of thumb apply to NATO armies. Modern mortars, because of their lighter weight and simpler, more transportable design, are usually an integral part of infantry and, in some armies, armor units. This means they generally don't have to concentrate their fire so their shorter range is not a disadvantage. Some armies also consider infantry operated mortars to be more responsive than artillery, but this is a function of the control arrangements and not the case in all armies. However, mortars have always been used by artillery units and remain with them in many armies, including a few in NATO. In NATO armies artillery is usually assigned a tactical mission that establishes its relationship and responsibilities to the formation or units it is assigned to. It seems that not all NATO nations use the terms and outside NATO others are probably used. The standard terms are: direct support, general support, general support reinforcing and reinforcing. These tactical missions are in the context of the command authority: operational command, operational control, tactical command or tactical control. In NATO direct support generally means that the directly supporting artillery unit provides observers and liaison to the manoeuvre troops being supported, typically an artillery battalion or equivalent is assigned to a brigade and its batteries to the brigade's battalions. However, some armies achieve this by placing the assigned artillery units under command of the directly supported formation. Nevertheless, the batteries' fire can be concentrated onto a single target, as can the fire of units in range and with the other tactical missions. There are several dimensions to this subject. The first is the notion that fire may be against an opportunity target or may be prearranged. It the latter it may be either on-call or scheduled. Prearranged targets may be part of a fire plan. Fire may be either observed or unobserved, if the former it may be adjusted, if the latter then it has to be predicted. Observation of adjusted fire may be directly by a forward observer or indirectly via some other target acquisition system. Counterbattery fire - delivered for the purpose of destroying or neutralizing the enemy's fire support system. Counterpreparation fire - intensive prearranged fire delivered when the imminence of the enemy attack is discovered. Covering fire - used to protect troops when they are within range of enemy small arms. Defensive fire - delivered by supporting units to assist and protect a unit engaged in a defensive action. Final Protective Fire - an immediately available prearranged barrier of fire designed to impede enemy movement across defensive lines or areas. Harassing fire - designed to disturb the rest of the enemy troops, to curtail movement and, by the threat of losses, to lower morale. Interdiction fire - placed on an area or point to prevent the enemy from using the area or point. Preparation fire - delivered before an attack to weaken the enemy position. Close supporting fire - placed on enemy troops, weapons or positions which, because of their proximity present the most immediate and serious threat to the supported unit. Suppression fire - that degrades the performance of a target below the level needed to fulfil its mission. Suppression is usually only effective for the duration of the fire. The tactical purposes also include various 'mission verbs', a rapidly expanding subject with the modern concept of 'effects based operations'. The targeting process is the key aspect of tactical fire control. Depending on the circumstances and national procedures it may all be undertaken in one place or may be distributed. In armies practising control from the front most, if not all of the process, may be undertaken by a forward observer or other target acquirer. This is particularly the case for a smaller target requiring only a few fire units. The extent to which the process is formal or informal and makes use of computer based systems, documented norms or experience and judgement also varies widely armies and other circumstances. Obviously airburst munitions significantly increase the relative risk for lying men, etc. Historically most casualties occur in the first 10 - 15 seconds of fire, ie the time needed to react and improve protective posture, however, this is less relevant if airburst is used. ordering the guns to fire together, either by executive order or by a 'fire at' time. The disadvantage is that if the fire is concentrated from many dispersed fire units then there will be different times of flight and the first rounds will be spread in time. To some extent a large concentration offsets the problem because it may mean that only one round is required from each gun and most of these could arrive in the 15 second window. burst fire, a rate of fire to deliver 3 rounds from each gun within 10 or 15 seconds, this reduces the number of guns and hence fire units needed, which means they may be less dispersed and have less variation in their times of flight. Smaller calibre guns, such as 105mm, have always been able to deliver 3 rounds in 15 seconds, larger calibres firing fixed rounds could also do it but it wasn't until the 1970s that a multi-charge 155mm howitzer, FH-70 first gained the capability. multiple round simultaneous impact (MRSI), this was a stunt popular at artillery demonstrations in the 1960s. It means that each gun fire two or more rounds at different charges and elevation angles, hence different times of flight, timed so that they all land together, although France, logically, defines 'simultaneous' as arriving within a 15 second window. More modern MRSI is enabled by computer calculation of firing data and facilitated by electronic data transmission of this data to a gun's laying system. Whether MRSI, with its increased risk of a mistake, needing a range to the target that gives time for several rounds to be fired and only useful against a few types of target in an era where PPD fuzes are becoming standard, is still merely a stunt or has real tactical value over other methods is moot. time on target, fire units fire at the time less their time of flight, this works well with prearranged scheduled fire but is less satisfactory for opportunity targets because it means delaying the delivery of fire by selecting a 'safe' time that all or most fire units can achieve. It can be used with both the previous two methods. Indirect fire was introduced so that artillery could fire from behind cover to reduce its exposure to enemy artillery by making itself more difficult to find. Interestingly while armies were doing this little thought was given to the need for counter-counter measures. Perhaps the only means of finding concealed guns was observation from kites or balloons. However, effective counterbattery fire needs far more than a single method of observation. Counterbattery (CB) fire emerged and developed extremely quickly during World War 1. Since that war CB has continued to evolve, mainly due to improvements in technology. The targets of CB fire are usually the enemy's guns, launchers and mortars, both the materiel and the men serving them. The formal NATO definition of the term counterbattery is 'fire delivered for the purpose of destroying or neutralising the enemy's fire support system', with the note that it may be proactive or reactive. This may be achieved by attacks on any part of the field artillery system. In some armies at some periods CB has been called 'counter-bombardment' and occasionally 'counter-mortar' has been handled somewhat separately. Aeroplanes (that is, by visual observation). Survey Sections (ie flash spotting). Ground Observers (artillery and 'intelligence posts of other arms'). Liaison Officers (artillery at infantry brigade HQs, these obtained reports of enemy artillery activity). Captured Documents and Prisoner's Statements. Listening Sets (ie monitoring enemy communications). Intercepted Wireless (by 'wireless compass stations'). Apart from Balloons and Officers Patrols these sources continued to play their part in World War 2, and their technology improved, although flash spotting became less useful as ranges increased and flashless (or low flash) propellants became widespread. A successor to Officers' Patrols had an isolated emergence in Italy when Canadian artillery observers were put ashore behind German lines and established themselves to observe gun positions. Sound ranging and flash spotting both required enemy guns to fire. Furthermore others, such as radio direction finding and information from prisoners, are insufficiently precise to 'fix' a target for artillery attack. Information from others may not be received quickly and hence be out of date, the hostile battery having moved. These methods were joined by radar in World War 2; while this could detect a shell in flight the gun that fired it could not usually be seen and the shell's elliptical trajectory made it impossible to extrapolate backwards. However, mortar bombs have a parabolic trajectory (as do guns firing in 'high angle') defined by a simple mathematical equation with two points on the parabolic curve. It was therefore possible to deduce a mortar's position by tracking its bomb. Another method that emerged was crater examination, this could reveal the azimuth back to the hostile gun or mortar and study of fragments could reveal its type. However, while it was a useful source of information it was not sufficiently accurate to give a location for the firer. UAVs, about 1960 an Unmanned Air Vehicle, the SD-1, entered artillery service. This early UAV used wet film photography by day or night, had short range and short endurance. However, being under artillery control they were responsive to CB needs, which was just as well because other forms of air reconnaissance were becoming less available and were not notably timely. Other UAVs, including drones (flying a programmed course) duly emerged, including the ability to transmit imagery in real-time. Next, in the 1970s Hughes Aircraft developed the US Firefinder system and created the algorithms that could extrapolate a gun's position from a segment of an elliptic trajectory. Its likely the Soviet Union created similar algorithms. Non-communications ELINT, which can detect and locate radars, including those used by artillery is an often forgotten source. A few armies established artillery observation patrol units to operate in likely artillery deployment areas behind the enemy's forward units. Intelligence about hostile artillery positions. The enemy artillery order of battle. Intelligence about hostile artillery activity and deployment and assessments of its wider implications. CB Intelligence is usually combined with CB fire control, although intelligence purists recognize this is not good practice and the two were separate in the British forces in France in World War 1. In both World Wars CB intelligence and CB control were found to be most effective when they were at corps level. However, the final year of World War 2 showed that the counter mortar battle was really one for brigade level. Since that war CB has tended to move to lower levels and in some armies has grown into a wider deep supporting fire organization. The CB fire control problem is that it does not always make tactical sense to attack hostile batteries the moment they are located. This is magnified by the challenges of targeting hostile batteries. The are many factors, and their significance depends on the circumstances. The first issue, for targeting, is that historically it's difficult to 'knock-out' a battery, although smart munitions against SP guns may change this. This highlights the point that it is important to be clear what result is wanted from CB fire. As the quoted definition states 'Destroy' is one possibility, another is Neutralization to render the battery temporarily ineffective or unusable, including by suppressing it or forcing it to move. However, suppression only lasts while CB fire is falling and if a hostile battery moves then it has to found again. It's important to get the result that best fits the tactical situation, and sometimes it is best just to record the location of the hostile battery and leave it for later. Good CB officers are cunning and wily tacticians. The final aspect of the CB equation is having available CB fire units and appropriate munitions. Typically these are general supporting fire units, but direct supporting fire units are also used if they are available and not fully occupied by their primary role. With conventional HE shells it may require the concentrated fire of 5 - 10 batteries to deal effectively with one hostile battery. Hence the attraction multi-rocket launchers such as MLRS able to deliver a heavy and concentrated attack from relatively few launchers. Digging, in World War 1 even heavy artillery was dug-in with several feet of overhead protection. Even today North Korean artillery is widely thought to be relatively immune to CB fire because of its deeply entrenched positions. More generally precision munitions have decreased the value of digging. Fully armored self-propelled guns were introduced to provide protection against conventional HE fire. Nuclear artillery adopted 'shoot & scoot', guns fired a single round and moved out immediately, it seemed to surprise many when Iraqi Scuds used the technique in 1991. Some multi-rocket launchers use the same tactic and move after firing a salvo. Increasing the dispersion of guns in a position, this has been aided by computers for technical fire control. Introduction of guns with self-survey and orientation has led to the concept of 'gun maneuver areas' where the troops, platoons or sections of a battery keep moving around, although there are doubts about how sustainable this is. Concealment, while firing guns cannot be concealed from sound ranging and radar, concealment and deception can reduce their likelihood of detection by other methods. Of course there are many potential target 'nodes' in the field artillery system, including those dedicated to finding hostile artillery. Attacking these may significantly blind the enemy's CB capability - counter counter counter measures. The types of cannon artillery are generally distinguished by the velocity at which they fire projectiles. Naval guns or infantry support guns are typically longer-barreled, low-trajectory, high-velocity weapons designed primarily for a direct-fire role. Typically the length of a cannon barrel is greater than 25 times its caliber (inner diameter). Howitzers are relatively shorter. Capable of both high- and low-angle fire, they are most often employed in an indirect-fire role, capable of operating in defilade. Typically, the length of a howitzer cannon is between 15 and 25 times its caliber. Mortars are smaller, low-velocity, high-angle weapons capable of only high-trajectory fire at a relatively short range. Typically the length of a mortar barrel is less than 15 times its caliber. Modern field artillery can also be split into two other categories: towed and self-propelled. As the name suggests, towed artillery has a prime mover, usually a jeep or truck, to move the piece, crew, and ammunition around. Self-propelled howitzers are permanently mounted on a carriage or vehicle with room for the crew and ammunition and are thus capable of moving quickly from one firing position to another, both to support the fluid nature of modern combat and to avoid counter-battery fire. There are also mortar carrier vehicles, many of which allow the mortar to be removed from the vehicle and be used dismounted, potentially in terrain in which the vehicle cannot navigate, or in order to avoid detection. infantry support guns - directly support infantry units (mostly obsolete). mountain guns - lightweight weapons that can be moved through difficult terrain. howitzers - capable of high angle fire. gun howitzers - capable of high or low angle fire with a long barrel. mortars - weapons that fire projectiles at an angle of over 45 degrees to the horizontal. rocket artillery - alternative propulsion. centrifugal weapon - silent weapons using kinetic energy generated in a centrifuge. Motorized artillery - towed by Artillery tractors. Self-propelled artillery - typically guns, mortars or gun howitzers mounted on a vehicle. Naval artillery - cannons mounted on warships and used either against other ships or in support of ground forces. The crowning achievement of naval artillery was the battleship, bristling with guns of up to 18 inches (45 cm), but the advent of airpower and missiles have rendered this type of artillery largely obsolete. Coastal artillery - Fixed-position weapons dedicated to defense of a particular location, usually a coast (e.g. the Atlantic Wall in WW II) or harbor. Not needing to be mobile, coastal artillery used to be much larger than equivalent field artillery pieces, giving them longer range and more destructive power. Modern coastal artillery (such as Russia's 'Bereg' system) is often self propelled, (allowing it to avoid counter-battery fire) and fully integrated, meaning that each battery has all of the support systems that it requires (maintenance, targeting radar, etc.) organic to its unit. Anti-aircraft artillery - weapons, usually mobile, designed for attacking aircraft from the ground. Some guns were suitable for dual-role anti-aircraft and field (anti-tank) use. The WWII German 88 mm gun was a famous example. Modern field artillery (Post-World War I) has three distinct parts: the forward observer (or FO), the fire direction center (FDC) and the actual guns themselves. The forward observer observes the target using tools such as binoculars, laser range-finders, designators and call back fire missions on his radio, or relays the data through a portable computer via an encrypted digital radio connection protected from jamming by computerized frequency hopping. The FO can communicate directly with the battery FDC, of which there is one per each battery of 4-8 guns. Otherwise the several FOs communicate with a higher FDC such as at a Battalion level, and the higher FDC prioritizes the targets and allocates fires to individual batteries as needed to engage the targets that are spotted by the FOs or to perform preplanned fires. The Battery FDC computes firing data - ammunition to be used, powder charge, fuse settings, the direction to the target, and the quadrant elevation to be fired at to reach the target, what gun will fire any rounds needed for adjusting on the target, and the number of rounds to be fired on the target by each gun once the target has been accurately located - to the guns. Traditionally this data is relayed via radio or wire communications as a warning order to the guns, followed by orders specifying the type of ammunition and fuse setting, direction, and the elevation needed to reach the target, and the method of adjustment or orders for fire for effect (FFE). However in more advanced artillery units, this data is relayed through a digital radio link. Other parts of the field artillery team include meteorological analysis to determine the temperature, humidity and pressure of the air and wind direction and speed at different altitudes. Also radar is used both for determining the location of enemy artillery and mortar batteries and to determine the precise actual strike points of rounds fired by battery and comparing that location with what was expected to compute a registration allowing future rounds to be fired with much greater accuracy. A technique called Time on Target (TOT) was developed by the US Army during World War 2. This technique uses a precise determination of the time of flight from each firing battery to the target area. When a Time on Target is designated each battery that will join in firing on that target subtracts the time of flight from the TOT to determine the time to fire. Individual firing batteries train to fire their rounds as close to simultaneously as possible. When each firing battery fires their rounds at their individual time to fire every round will reach the target area nearly simultaneously. This is especially effective when combined with techniques that allow fires for effect to be made without preliminary adjusting fires. This is a modern version of the earlier "time on target" concept in which fire from different weapons was timed to arrive on target at the same time. It is possible for modern computer-controlled artillery to fire more than one volley at a target and have all the shells arrive simultaneously, which is called MRSI (Multiple Rounds Simultaneous Impact). This is because there is more than one trajectory for the rounds to fly to any given target - typically one is below 45 degrees from horizontal and the other is above it, and if you can vary the amount of propellant with each shell, you can create more trajectories. Because the higher trajectories cause the shells to arc higher into the air, they take longer to reach the target and so if the shells are fired on these trajectories for the first volleys (starting with the shell with the most propellant and working down) and then after the correct pause more volleys are fired on the lower trajectories, the shells will all arrive at the same time. This is useful because many more shells can land on the target with no warning. With traditional volleys along the same trajectory, anybody at the target point will have a certain amount of time (however long it takes to reload and re-fire the guns) to run away or take cover between volleys. In addition, if guns in more than one location are firing on one target, with careful timing it can be arranged for all their shells to land at the same time for the same reason. Examples of MRSI guns are South Africa's Denel G6-52 (which can land six rounds simultaneously at targets at least 25 km away) and Germany's Panzerhaubitze 2000 (which can land five rounds simultaneously at targets at least 17 km away). The Archer project (Developed by BAE-Systems in Sweden), a 120 mm howitzer on a wheeled chassis claiming to be able to deliver up to 7 shells on target simultaneously from the same gun. The United States Crusader program (now cancelled) was slated to have MRSI capability. An additional wrinkle can be added when some or all of the shells are set for airburst, meaning they explode in the air above the target instead of upon impact. This can be accomplished either through time fuses or proximity fuses. Time fuses use a precise timer to detonate the round a certain amount of time after firing. Unfortunately, this technique is tricky and slight variations in the functioning of the fuse can cause it to explode too high and be ineffective, or to strike the ground instead of exploding above it. Since December 1944, proximity fused artillery rounds have been available that take the guesswork out of this process. These rounds embody a miniature, weak radar transmitter in the fuse to detect the ground and explode them at a predetermined height above it. The return of the weak radar signal completes an electrical circuit in the fuse which explodes the shell. This is a very effective tactic against infantry and light vehicles, because it scatters the fragmentation of the shell over a larger area and prevents it from being blocked by terrain or entrenchments that do not include some form of robust overhead cover. Combined with TOT or MRSI tactics that give no warning of the incoming rounds, these rounds are especially devastating because many enemy soldiers are likely to be caught in the open. This is even more so if the attack is launched against an assembly area or troops moving in the open rather than a unit in an entrenched tactical position. ↑ AAP-6(2006) NATO Glossary of Terms and Definitions. Bailey, J.B.A. Field Artillery and Firepower. Annapolis, MD: Naval Institute Press, 2003. ISBN 1591140293. Hogg, O.F.G. Artillery: Its Origin, Heyday and Decline. North Haven, CT: Archon Books, 1970. ISBN 0208010408. Norris, John. Artillery: An Illustrated History. Gloucestershire, UK: Sutton Publishing, 1965. ISBN 0750921854. Portsmouth Action Field Gun Pictures and Video. Evans, Nigel F. (2001-2007) "British Artillery in World War 2". Artillery Tactics and Combat during the Napoleonic Wars. Artillery of Napoleon's Imperial Guard. 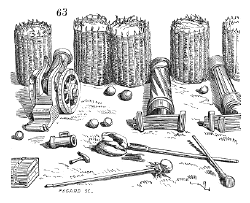 French artillery and its ammunition. XIVth to the end of the XIXth century. This page was last modified on 19 April 2016, at 19:13.